McCREIGHT, JOHN FOSTER, lawyer, politician, and judge; b. 1827 in Caledon (Northern Ireland), son of James McCreight, a Church of Ireland clergyman, and Elizabeth Foster; d. 18 Nov. 1913 in Hastings, England. Born into the Protestant ascendancy that dominated Irish political and social life in the 18th and early 19th centuries, John Foster McCreight was well connected to church and state through his father’s and particularly his mother’s family. His early years-what little is known of them – were much as might be expected. After attending the College of St Mary, in Winchester, England, he entered Trinity College, Dublin. He did four years of legal training at the King’s Inns in Dublin and was called to the Irish bar on 9 Nov. 1852. With his expectations somewhat diminished by his father’s early death and with the fortunes of the ascendancy, and hence of his extended family, uncertain, McCreight emigrated to the colonies. He was 25 and such an adventure may have held some appeal in itself as well. In any case, he was not the first of his family to leave Ireland. Immediately following his call to the bar he went to Australia, as two of his cousins had done. He set up practice in Melbourne. After seven years, whether it was the lure of adventure and the better economic prospects promised by the Fraser River gold-rush or the fact that the city had become an uncomfortable place because of the alleged misdeeds of his cousins, by then prominent politicians, McCreight packed himself and his law books on a boat to San Francisco, and then Victoria. He arrived in the island capital sometime in 1860. At 33 McCreight was ready to settle. For the next 20 years he lived on Michigan Street and involved himself in the associational life of the colonial city. No official record of a marriage has been discovered, though there are indications in the press and private correspondence that a Mrs McCreight attended various social functions. Some have speculated that a scandalous affair with a woman had led McCreight to leave Australia and seek out a place where he and his wife could start afresh. Others believe he married a woman he met in San Francisco en route to Victoria. There was definitely not a Mrs McCreight on the scene in 1871 when John Foster became premier of the new province – and hence attracted greater public scrutiny. None of his biographers has found evidence of a subsequent marriage, but the 1881 census lists him as married and an Elizabeth Ann McCreight, aged 42 and also married, is reported to be residing at the same address. Unlike his legal colleagues Matthew Baillie Begbie* and Henry Pering Pellew Crease*, McCreight was not given to participating actively in the dinner parties and dances of Victoria society. A retiring, and some would say difficult man, he preferred to spend his time alone with his two loves: his horse and his law books. His membership in the masons – he joined them in 1866 and became deputy grand master of the Grand Lodge of British Columbia in 1873 – and his involvement in the Church of England seem to have been motivated by a mixture of faith and ambition. At Christ Church Cathedral, McCreight shared a pew with other colonial luminaries such as Begbie and Crease. He was the people’s warden from 1869 to 1873 and again from 1875 to 1876. In addition, he represented Christ Church as a lay delegate to Anglican synods from 1874 to 1883. His participation in the church’s administration coincided with a highly charged split between Edward Cridge, the dean, and Bishop George Hills*, essentially over low church versus high church practices. The connections he made through the masons and the church likely helped McCreight with his other community involvement, politics. Though he had held no elected office during the colonial period, after British Columbia became a province of Canada on 20 July 1871, he became attorney general in the interim ministry that was in place from mid August to mid November. 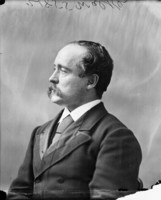 On 16 October, during the first provincial general election, he won a seat for Victoria City in the Legislative Assembly, and Lieutenant Governor Joseph William Trutch* chose him to be British Columbia’s first premier on 13 November. He continued to hold the attorney-generalship as well. Though the first session of the Legislative Assembly under his administration was a productive one, marked by the introduction of some 54 pieces of legislation and the passage of 36, the experience only confirmed McCreight’s prejudices about the dangers of popular rule: provincial politicians were possessed of narrow and sectional interests and not to be trusted. He was right – at least as far as his own political future went. On 19 Dec. 1872, just days after the opening of the second session, Thomas Basil Humphreys* introduced a motion of no-confidence. Abandoned by some of his supporters, McCreight resigned. He sat in the assembly for three more years but returned to private practice in 1875, this time as a qc. However, his stint at it was short-lived, for he was appointed to the province’s Supreme Court on 26 Nov. 1880, and served in the Cariboo, Victoria, and finally New Westminster districts until 1897. Not long after his retirement, he left British Columbia for England, and he eventually settled at Hastings. At his death he was lodging in the residence of a Mrs Mary Jane Fisher – perhaps having found the human companionship he had lacked for so many years. John Foster McCreight’s life was emblematic of certain aspects of the 19th century. In many ways he was a typical British migrant: possessed of expectations greater than the economic means he had to fulfil them, he recognized that geographic mobility was a route to success. Well schooled in middle-class manners and in the law, he established himself readily and apparently comfortably first in Melbourne and then in Victoria. Such intercolonial movement is indeed another aspect of 19th-century British immigration. Moreover, once in British Columbia he did not stand still. Though much of his time was spent in Victoria, he also lived in the Cariboo and New Westminster, and travelled between all three places regularly, if not altogether happily. More broadly, McCreight was possessed of a turn of mind peculiar to the Anglo-American world of the time. It manifested itself in the form of a great certainty about the ways of the world and was rooted in faith: faith in the law and in people’s capacity to know. Beneath this outward certainty, however, there were tensions between the need for certainty and the desire to pursue knowledge. For McCreight the key to social order lay in knowing the rules and applying them both reactively and prescriptively. 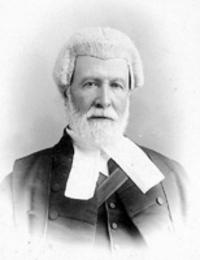 A legal fundamentalist as it were, he had little patience for the loose interpretive ways of Supreme Court justice Begbie, with whom he clashed several times, but most notably in Cranford v. Wright (1862), in which the judge’s behaviour precipitated McCreight’s resignation from the British Columbia bar. Celebrated by some and belittled by others for his great knowledge of common and statute law and his penchant for citing textbook authorities, McCreight considered himself “only a machine to carry out the law.” The metaphor is telling, for not only does it embody an understanding of the law as a disembodied set of rules and imply that socially desirable results came from simply applying them to particular circumstances, but it also points to a faith in technology – another aspect of the 19th-century turn of mind. If worldly affairs were better ordered by an adherence to and a close study of secular law, spiritual affairs were enhanced by a knowledge and application of the word of God. When McCreight subjected his own faith to the same intense gaze he reserved for his law books, the effect was initially unsettling. He experienced a crisis of faith, sometime in the 1880s and converted to Roman Catholicism in 1883. Though the immediate crisis appears to have been precipitated by a close reading of Anglican theology, McCreight’s conversion may have had a longer gestation, perhaps growing out of his distress over the Cridge affair and his friendship with James Maria McGuckin*, a priest he had come to know during his sojourn in the Cariboo. Shaken, he embraced the “one true faith” with the same absolutism he did the law until his death in 1913. BCARS, A/E/C86/C86/A 171, 3 Aug., 5 Dec. 1863. Daily Colonist (Victoria), 11 Aug. 1860, 27 Oct. 1872, 30 Nov. 1880, 18 Nov. 1897. North Pacific Times and British Columbia Advertiser (New Westminster), 12 Nov. 1864. Canada Gazette, 27 Nov. 1880. S. W. Jackman, Portraits of the premiers: an informal history of British Columbia (Sidney, B.C., 1969). P. M. Johnson, “John Foster McCreight,” “McCreight and the law,” “McCreight and the bench,” and “McCreight and the church,” in British Columbia Hist. Quarterly (Victoria), 12 (1948): 79–92, 127–19, 211–29, and 297–309. Judges of British Columbia to 1957: a sourcebook . . . , comp. J. N. Fraser (Victoria, 1984). M. A. Ormsby, British Columbia: a history ([Toronto], 1958). R. L. Reid, “R.W. Bro. John Foster McCreight,” Freemasons, Grand Lodge of British Columbia, Proc. (Vancouver), 70 (1941): 173. W. N. Sage, “John Foster McCreight, the first premier of British Columbia,” RSC, Trans., 3rd ser., 34 (1940), sect.ii: 173–85. Scholefield and Howay, British Columbia. Tina Loo, “McCREIGHT, JOHN FOSTER,” in Dictionary of Canadian Biography, vol. 14, University of Toronto/Université Laval, 2003–, accessed April 26, 2019, http://www.biographi.ca/en/bio/mccreight_john_foster_14E.html.